Earlier this year I wrote a post about having Visio update a field on a shape automatically when editing any other field, making it possible to always know when the metadata was last changed. In the comments I was asked to share the Visio sheet which it now is time to do. 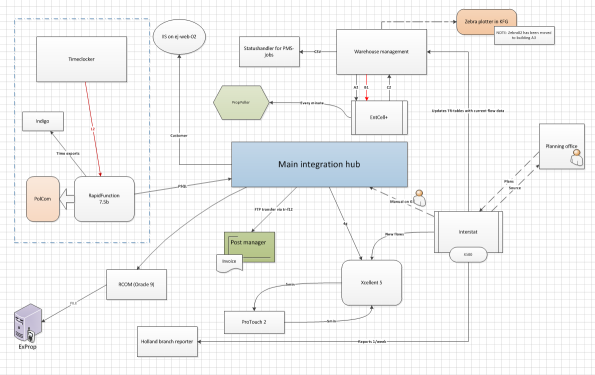 This is the result of that request, in some way documenting my attempt to use Visio to document an integration platform. Hopefully you can gain some ideas to use in your documentation endeavours. 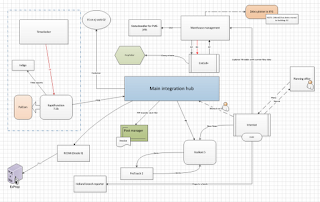 In almost all of my encounters of different integration platforms at various companies, there has been a high level view of the entire integration setup showing the various message flows available. This map has usually been constructed in Visio. There has also been two types of layouts, lets call them the structured layout and the unstructured layout. The following is an example of the unstructured layout. It's common and does a fairly good job at describing the full environment. It is often seen when there has not been a true approach to working with integrations. Most of the time they are filled with objects, with varying descriptions, showing the entire network.You can see that two systems interact, but you do not know in which way. It is also often hard to see how everything is connected if you as in the example has an integration hub in the middle, doing some message routing. Hence we get the structured layout as is seen below. In this case, there is a very solid structure with the integration platform in the middle, and the integrated systems on both sides with arrows showing each and every message flowing through. These maps are good at showing the message flows as every message is entered, but it doesn't give you the overall picture that the unstructured layout gives you since a lot of fluff is stripped away. Usually there has also been an improvement from the unstructured layout in that each message flow has been given an identity which then maps to more detailed documentation in a file archive or document portal. So, earlier this year I did a test with a variant of the structured layout, seeing if I could document the current state of integrations at my current job. The map I was given from the beginning was according to the unstructured layout. A lot of information was out of date, systems had been taken out, others taken in, versions changed, message flows altered and so on. 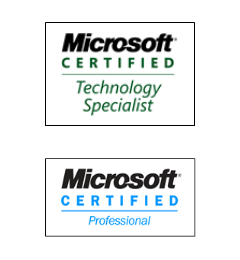 I had to create an up to date picture of the integrations, so that I could commence working with them. In order to make it easier updating and changing these properties/metadata for all shapes, I changed the Shape Sheet to make the form data window open when doubleclicking on the shape. You can do this by editing the Shape Sheet property "EventDblClick" under "Events" to read "=DOCMD(1312)". Many of the fields are defined in the form data editor as dropdown menus as to make the data more consistent and easier to edit. 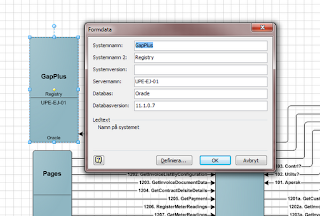 I also added the "From system" and "To system" in order to get good documentation automatically created by exporting the form data to Excel. As with the System shapes, I added the doubleclick event to the shape. I also altered the shape so that the choices made in the form data will be visible in the shape. Depending on the "Status", the arrow will be yellow (planned), green (under development), black (in use) or red (to be removed). This is done by editing the Data Graphic and setting that each value will match a specific color. Also, setting the "Automatic" to "No" will show a little man besides the ID and Object name. This can be set in the Shape Sheet as well under "Text fields" and "Value". In my case, the formula is: =IF(STRSAME(Prop.Automatic,"No",TRUE)," 웃","")&" "&Prop.ID&". "&Prop.Objectname&" ". But is of course dependent on the name you give each property in the form data. In the same manner, I have a setting that will change the arrows on the shape so that I get an indication if it is a one way transfer or a request-response one, by adding a little unfilled arrow in the other direction of the data flow. 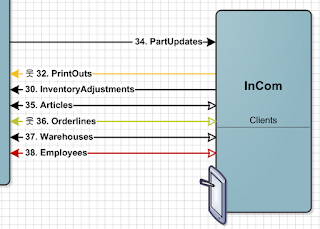 I have also adjusted where the text appears on the connector according to this post from the Visio Guy, so that the text is always at the end of the line instead of in the middle. So, is this a good way of documenting message flows? Well, in this case, it has been very helpful. I have a single document that shows me quite a lot of the current setup and state. It eases on the job of manually editing shapes to indicate whether it is a planned message flow, if it is request-response, a manual job and so on. Instead, I just select the desired property and let Visio format the shape accordingly, giving me a neat view of the state. 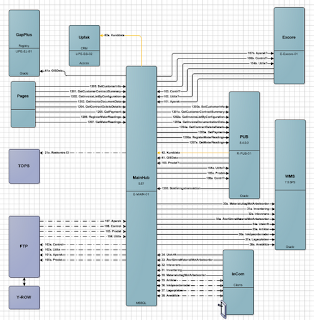 After documenting all message flows in this Visio document, I will most likely strip it down. I will remove a lot of the metadata in the connection shapes, and have this solely in the integration specification document that I will create for each message. I do not like to have duplicate information in my documentation, and I feel that that sort of data will belong better in the written documentation than in the Visio sheet. I will still keep the color coding depending on Status, as well as some other visual cues that is helpful when looking at the overall view of the integration platform. I find you blog very interesting. I am interested to learn more about Unstructured layout on visio. can you please, recommend me any open source to learn more in detail about the unstructured layout type of integration for IT? can you please provide me some document that you can possibly offer me from your library? As for documents and learning material, I can only direct you to the online documentation as well as the "standard" books on the matter. 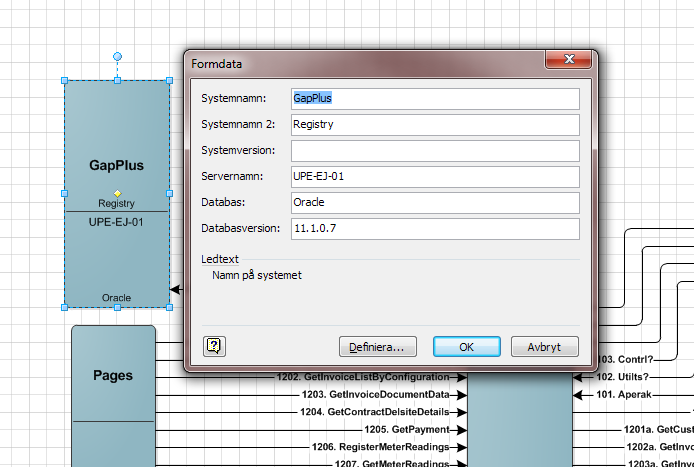 Those are the sources I've used when learning how to work with Visio togheter with some trial and error. I'll see if I can fix an adjusted copy of the document used in the article and upload it. It is however in Swedish right now and populated with client data and hence not suitable for sharing at this point. Right now, I am actually trying to learn about Business Application integration (unstructured layout) and I don't have any material that I can look for other than this post. 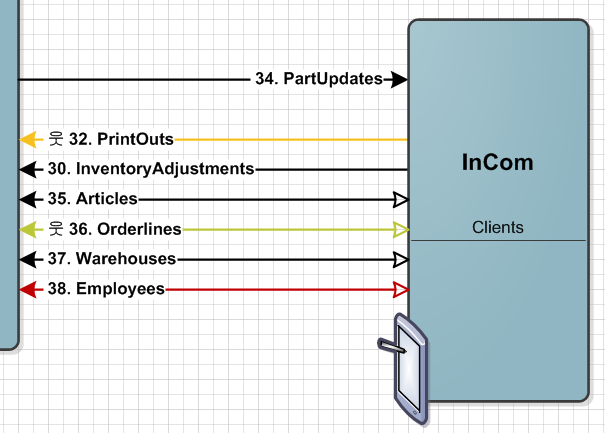 I am interested to do my documentation the structured layout way you have mentioned above.So what visio template did you use to start documenting the structured way. It's just a blank template. Shapes and macros are created manually to fit what I needed at that time.